The multiple and diverse forces of globalization have, indeed, affected Japan significantly over the past decades. But so, it must be said, has Japan influenced a variety of critical global developments - globalization is not a one-way street, particularly for a nation as economically influential and technologically advanced as Japan. 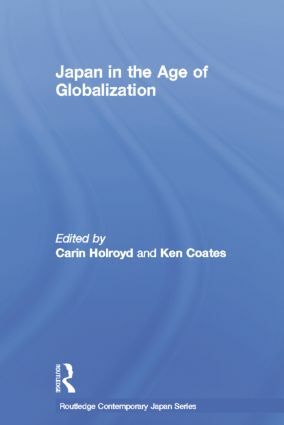 The chapters in this collection examine the impact of globalization on Japan and the impact of Japan on the forces of globalization from the various disciplinary perspectives of business, the economy, politics, technology, culture and society. They also explain the manner in which the nation has responded to the economic and cultural liberalization that has been such a profound force for change around the globe. This comprehensive collected works brings the latest research to bear on this important subject and provides evidence of the long history of global influences on Japan – and Japanese impacts on the rest of the world. Carin Holroyd is Assistant Professor of Political Science at the University of Waterloo, Canada. Ken Coates is Professor of History and Dean of the Faculty of Arts at the university of Waterloo, Canada.